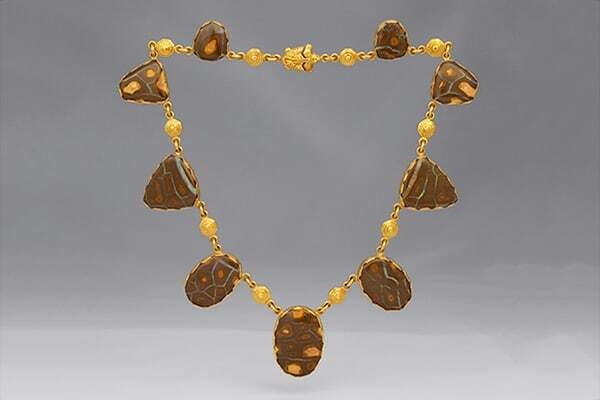 erhaps you can tell that the Golden Turtle Necklace was inspired by the unique patterns, coloration and cut the Australian Boulder Opals that it features. Don’t they remind you of Turtle shells as well? If you look closely, you’ll see that the gold work carries on the motif of the turtle, and that the clasp is actually a small golden turtle. Nine Australian Opals are se in this 22 carat gold necklace, which took a total of 527 hours to craft in the Zoein Jewels workshop. 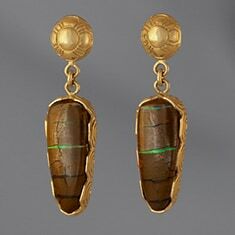 The tradition of symbolic jewelry touches on some of earliest spiritual incites of ancient man. The peoples of the past found that certain particularities of nature, like the turtle, expressed metaphysical insights and conveyed through analogy, universal truths. In the Native American and Tibetan traditions the turtle remembered for the instrumental role in the creation of the world. This is why the turtle is often pictured carrying the world on its back, as you can see in the engraving to the right. This association in a symbolic sense, may not be as far fetch as it first appears to be. A turtle’s underside, it’s plastron, is a hard flat shell representing the plane of existence, with it’s four legs being the four directions. A turtle’s upper dome, its carapace, is suggestive of the celestial vault of heaven. Rib like seams divide the under side of it’s shell like the bands of longitude and latitude that cut and partition the cosmic shell of space and time. The earth itself is like a giant turtle swimming through the universal ocean. The atmospheric shell that encircles the earth, enshrines and protects life from radiation. The golden Turtle Necklace can’t help but resemble a tortoise as well. The turtle lives in the sea while the tortoise is land based. Through an evolutionary bifurcation, this genus has adapted to both the under/sea and over/earth, which is yet another way that it spans the divide of duality. A turtle’s extremities not only reach out to grasp and move about in the world, but recoil into the stillness within, absorbed by the inner space of body/mind-consciousness. Likewise the hardness of a turtle’s shell is contrasted by the softness of its flesh. The Golden Turtle Necklace, like the turtle itself, is thus symbolic of natural harmonies, the universal symphony and the frequencies and rhythms of consciousness. Even though they seem to embody creation’s heavy, material nature, the turtle most often suggests a complementation of opposites. The acoustics of its shell contributed to the development of the musical arts. Legends recall that Hermes/Orpheus fashioned the first Lyre by stretching strands of hide across a tortoise shell. Music, the sense-ual expression of number, measures and divides the score of time and space. It only seems fitting that Saturn, who also cuts and divides, is said to have once appeared as a tortoise. In the Vedas it was the Creator-Brahma/Prajapati who appears in the form of a turtle. Saturn, who long ago was know as the creator and King of Paradise, is also personified as Adam/Manu, the primordial ancestor and ‘namer’ of form. In the same way that Saturn’s stifling heaviness is curbed, his formative and structural benefits are accentuated by wearing the Golden Turtle Necklace. Scientifically speaking turtles and tortoises are known as Testudines. Testudines hail from the time of dinosaurs. They’ve have been around for more than two hundred million years. Up until the last couple of hundred years a tortoises were abundant in the world’s oceans. Tortoises can live for months without food or water. Sailors simply flipped the animals on their backside and stacked them in the cargo hold of their ships to ensure a supply of fresh meat. This practice although good for the sailors obviously had devastating consequences for the tortoise, many species of which became extinct. It’s a sad fact that the Giant Galapagos Tortoise has nearly been wiped out. This tortoise can weigh up to thirteen hundred kilograms, has a shell width that reaches two meters and lives for hundreds of years. Ecological laws and foundations like the Charles Darwin Foundation of Santa Cruz are doing their best to reverse the trend before these endangered creatures go the way of their ancient friends the dinosaurs. The Golden Turtle Necklace is made in honor of this great species, and as you can see to the right, it’s actually part of a fine art jewelry set that includes matching turtle earrings.